Cancer, Bacteria and Viruses thrive in an Acidic Environment. Alkaline is key to your health! Acidic blood (having low pH levels) can create cause toxic and acidic waste (acidosis). This is a mostly unknown and dangerously destructive circumstance because it can lead to chronic diseases such as heart disease and cancer. Serious health problems such as low energy, unwanted weight gain, poor athletic performance and accelerated aging, inflammation and auto-immune disorders can be potentially increased as well. The bottom line is when your blood has an acidic pH, your body may be silently torn apart day by day to become more and more susceptible these insidious degenerative diseases. When you manage an alkaline pH daily and at minimum drink a lot of pure water, your body can rebuild, repair, rejuvenate and remain young! In many cases cancer was arrested in its tracks by those who shifted their blood to an alkaline state. This understanding is of great importance to someone who is fighting almost any disease or illness; as well as anyone who desires to simply feel better and remain youthful. What it means to you is... Your Body's pH affects just about EVERYTHING! To offset these challenges to well being, begin by managing your pH and hydrate, hydrate, hydrate with pure water! Life happens at the cellular level. If you do not manage that, life can happen poorly. All of the cells (trillions of them) that make up the human body are slightly alkaline, and must maintain that slight alkalinity in order to function and remain healthy and alive. Compromise that and the body suffers. As a result, the body may experience permanent and prolonged damage due to high acidity -- a condition that may go undetected for years, yet ultimately become deadly. A condition that you can manage. Medical studies report that a pH that is imbalanced can be correlated to almost all health conditions, including heart disease, arthritis and cancer. Virtually all leading biochemists and medical physiologists have recognized that your pH (acid-alkaline balance) is the most important aspect of a balanced, healthy and youthful body. Since most of the body is liquid, the pH level has profound effects on body chemistry, health and disease. Your body's pH management regulates breathing, circulation, digestion, elimination, hormone production and immune defense. The first major line of defense against sickness, disease and aging is the pH of your blood. Even your immune system will not work properly if your blood is even slightly acidic. Remember, the aging process, accelerated by acidic waste in your body, takes its toll every single day. By preventing this continuous accumulation of acidic waste in your bodies, we can in fact help to slow the aging process. We are not referring to stomach acid, saliva pH, or the pH of your urine. We are referring to the pH of the body's fluids, tissues and blood, which is an entirely different matter. pH stands for "potential of Hydrogen", which is a measure of the acidity or alkalinity of a solution, such as a mixture of liquids. It is measured on a scale of 0 to 14 -- the lower the pH the more acidic the solution, and the higher the pH the more alkaline the solution. When a solution is neither acid nor alkaline it has a pH of 7 (exactly in the middle), which is neutral. Your body's pH is best when between 7.36 and 7.44, which of course, is slightly alkaline. The body prefers a slightly alkaline pH of approximately 7.4, and if it drops below this for any length of time, it will suffer from the onset of degenerative disease. As we grow older, our chemical and physiological pH balancing mechanisms begin to poorly regulate, and as such, compounded by our acid-forming Western diets and lifestyles, we develop an overall acidic pH profile, which leads to the progression of most, if not all, degenerative diseases. Lack of rest and exercise, chronic stress, and not eating enough fresh fruits and vegetables all contribute to creating more acid waste, not disposing of it. Reduce your consumption of acid-producing foods like too much red meat and other animal meats (eat only moderate amounts), processed white flour products, refined foods and sugar, and acid-producing beverages like coffee and soft drinks. For example, on average a can of soda has a pH of 2.5, which is highly acidic! (Have you ever wondered how millions of people can consume incredible numbers of “diet sodas” and never lose a pound?) Additionally, we use too many drugs, which are acid forming; and we use artificial chemical sweeteners like NutraSweet, Equal, Splenda or aspartame, which are extremely acid forming. One of the best things we can do to correct an overly acid body is to correct our diet and lifestyle. (Refer to our 10 Step Anti-Aging Plan for specific help with diet and lifestyle guidelines). If your cellular pH deviates too far towards acidity, your cellular metabolism will literally shut down from being poisoned in toxic acid wastes, and your cells will die. As more and more acid is accumulated, the body slowly begins to drown in its own poisonous acid. Generally going unnoticed for years, these destructive wastes begin to silently corrode and eat away at your veins and arteries, destroying cells, and ultimately, entire organ function in your body. Without correcting your body pH, the damage becomes aggressively worse, and deadly over time. As our bodies becomes acidic, our pH level drops. When this happens, we start losing calcium out of the blood, the bones, and the tissues as a safety mechanism to protect ourselves. Now, your body's oxygen level also begins to drop, leaving you tired and fatigued(your immune system is compromised), allowing fungus, mold, parasites, bad bacteria, and viral infections to flourish and gain a hold throughout the body. Additionally, cancer thrives in an acid tissue pH/oxygen deficient environment. Is it any wonder today that cancer rates are up? It's interesting to note that you often won't have just one of these infectious invaders. If you have candida for instance, you will most likely also have bad bacteria, fungus, and parasites because they all flourish in the same acidic body terrain. Have you ever noticed how either you, or someone you know is just not feeling so well (although not clinically diagnosed as having a particular disease or illness), but they just don't know what the problem is? Well, many times it's as a direct result of their body being too acidic. You'd be amazed to find how your body will rejuvenate itself and have wonderful energy when you get your pH back in balance. We have the solution for you! Simple to use pH Balance Rx! If your body is in an acid state, cholesterol plaque buildup and heart disease are sure to follow. pH Balance Rx protects your cardiovascular (heart and circulation) system from developing arteriosclerosis, aneurysm, arrhythmia's, myocardial infarction (heart attack), stroke and high blood pressure. Halting an acid body pH is believed to be the first step towards preventing premature aging, wrinkling, hormone imbalances, eyesight disorders, memory problems and a host of other age-related concerns. pH Balance Rx is your frontline nutritional defense. As an example of pH Balance Rx's nutritional strength, it contains high amounts of chlorophyll, which not only helps to make your blood alkaline, but is the most powerful body cleansing agent known! Additionally, and quite amazingly, chlorophyll converts the sun's radiant solar energy into life-giving food energy, and also possesses the remarkable ability to help build new red blood cells which improves the oxygen flow within our bloodstream. Furthermore, it promotes intestinal regularity and detoxifies the bowel, liver, kidneys and blood. In short, it serves to coordinate your entire body's metabolism. PH Balance Rx's unique formula helps balance your over-acid pH and provides a powerhouse of nutrition. pH control impacts every biochemical process in the body. It is truly the secret of life, health and youth. With pH Balance Rx you're helping to prevent degenerative diseases, flood your blood with oxygen, supply powerful enzymes to give you the digestion of a teenager as well as the scientific equivalent of 4lbs. of garden fresh vegetables per day! 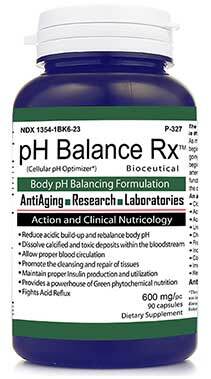 PH BALANCE Rx is a powerful body pH balancing formula. An acid pH is the breeding ground of premature aging and all degenerative disease, such as Heart Disease, Cancer, Osteoporosis and Diabetes. It works by reducing acidic build-up in the cells and helps to re-balance body pH as well as dissolve calcified and toxic deposits within the bloodstream. Without a slightly alkaline pH of the blood, you will never achieve your complete biological potential to live your longest life span. Let pH Balance Rx get your body in the proper state of healthy balance so you can live a healthy, disease free life of youthful energy and longevity! Your body is able to assimilate and utilize vitamins, minerals and nutrients properly only when its pH is balanced. It is therefore possible for you to be taking vitamins and minerals and other healthy nutrients and yet be unable to properly absorb or fully utilize them. And you wonder why your supplements aren't really working for you! If you're not getting the results you expected from your nutritional or herbal program, look for an acid /alkaline imbalance. Balancing your body pH can also help with Weight loss and Osteoporosis. Why should I take the other formulations AntiAging Research Laboratories provides along with AEON and SOMASTATIN? Your single most important health factor is the pH level in your blood. The vital importance of your body's pH balance is the most unknown and overlooked issue regarding your health and your ability to live to your genetic potential! The basic American/Western diet (meats, processed foods, white flour, sugar, alcohol, etc.) and lifestyle (and most recently the Atkins-like low-carb diets) creates a toxic, acidic state in your body. And if you drink coffee or sodas you're guaranteed to have a disease causing acidic pH. The most obvious symptoms that are seen everyday are bad breath and intestinal gas. But, the most dangerous and even deadly results of an acid blood pH are the degenerative diseases that creep up on you daily until you are suffering from the pain and agony of a heart attack, some form of cancer or debilitating disease. Your body simply will not work to its optimum potential if it does not have a slightly alkaline pH level. You must have a slightly alkaline pH! The startling truth is that if your body pH level is even slightly acid, you will never achieve all the health you are capable of. And worse, your body will never properly absorb the nutritional supplements you take, and will also be the breeding ground for degenerative disease”. Unfortunately, most people have an acid body pH (and you wonder why there are so many illnesses, diseases and health problems!). If you don't feel good, don't look as good as you know you should, or have very little energy, one of the most essential things that stands between you and perfect health and remaining young, is your body's pH. To remain healthy and youthful, the first thing you must do is establish that your body's pH is properly balanced. Proper cellular pH balance is absolutely vital for regenerating, healing, and rebuilding your body, as well as detoxifying and eliminating the accumulated toxins from the body, especially the liver and kidneys. No Risk Unconditional 100 Day Money-Back Guarantee.